For more DNA images, visit our DNA Collection Gallery, which includes over 100 images of liquid crystalline DNA, examining all known mesophases. As intelligent, sentient beings, it seems natural for humans to want to know themselves, to become conscious of their origins. Thus, it may be of little surprise that throughout time humans have contemplated heredity and hypothesized about the transmission of traits from parents to offspring. In some ancient civilizations, for instance, this transmission was believed to occur through the blood, a word that that is still commonly associated with lineage. Modern science has revealed, however, that it is not blood that conveys heredity, but genes. The substance that composes genes is deoxyribonucleic acid (DNA), a chemical that was first isolated in the 1860s, although its significance was not recognized until mid-twentieth century. DNA is a nucleic acid present in the chromosomes of cells and many viruses. Though primarily found in the nuclei of eukaryotes, various other organelles including chloroplasts and mitochondria also contain DNA, and in prokaryotes, the chemical is spread throughout the entire cell. In 1943, Oswald Theodore Avery presented the first convincing evidence that DNA was responsible for transmission of genetic information, but how this occurred was a mystery, especially since the chemical appeared to be solely composed of only four different nucleotides. During the 1950s, a handful of research groups were dedicated to solving the enigma of DNA by establishing its structure, a key to understanding how it carries out its functions. James Watson and Francis Crick were the first to correctly determine that DNA exists in the form of a double helix, two strands of the unusual molecule winding around one another into a spiral. Each strand, they discovered, is like a very long piece of string consisting of monomer nucleotides, each comprised of the sugar deoxyribose, a phosphate group, and a nitrogenous base. As earlier research suggested, there are only four different bases in DNA (adenine, guanine, cytosine, and thymine), but the variation in the ordering of the bases, it was eventually realized, is the foundation of the tremendous diversity in living organisms. These bases protrude, Crick and Watson deduced, from a phosphate-sugar backbone that holds the nucleotides of a DNA strand together via covalent bonds. Hydrogen bonds are, however, what holds the bases of two strands of DNA together to form a double helix. The bonds are only formed between certain bases: adenine with thymine and cytosine with guanine. Once the structure of DNA was determined, a number of new questions regarding the important chemical arose. Indeed, the diameter of the DNA molecule is about 25-30 angstroms (about a billionth of an inch), while the length can exceed a thousand microns (0.025 inch) in some organisms. Thus, a major problem in the nascent field of molecular biology was how this relatively giant molecule can be packaged into a cell or virus that is far smaller than its length, especially since it is important to the cell to be able to readily access the DNA for the purposes of genetic control, routine cellular maintenance, and reproduction. Over time, this problem was greatly elucidated by the discovery that the DNA of humans and many other organisms is intricately wrapped around a complex of histone proteins, much like beads on a string, in a complex that is termed chromatin. When chromatin condenses for cell division or the production of gametes, it forms higher-order structures that are termed chromosomes. There is a single DNA molecule per chromosome. The DNA of lower organisms, such as the virus, bacteria, other prokaryotes, and even some of the more simple eukaryotes, does not form highly organized chromosomes like the ones seen in higher organisms. Lower organisms often package their DNA in reactions that appear to follow the simple laws of thermodynamics: DNA is folded in a compact manner to maximize the entropy of the biological system. This is often accomplished by highly localized DNA concentrations that drive the molecule into a variety of liquid crystalline states. In the laboratory scientists usually investigate the physical and biological properties of DNA in dilute solution. However, DNA exists in vivo in domains where the localized concentrations are very high. 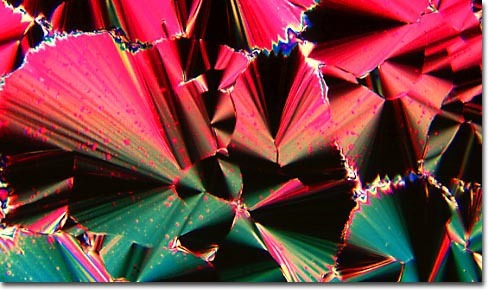 As the aqueous solution concentration of DNA is slowly increased, the macromolecule undergoes spontaneous phase transitions to form at least three distinct liquid crystalline phases, which are termed lyotropic phase transitions in the liquid crystal field. 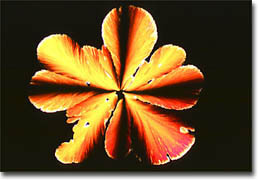 In a liquid crystalline phase, a substance exhibits a partial similarity to both isotropic liquids and crystalline solids, possessing some molecular organization but still being able to flow in certain directions. 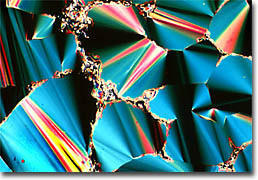 The precise behavior displayed by lyotropic liquid crystals is dependent on the concentration of molecules in solution. 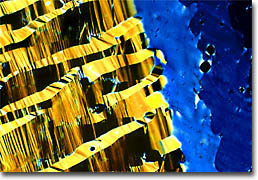 The phase of DNA depicted on the banner photomicrograph of this page is a high-density columnar hexatic liquid crystalline phase where the DNA concentration is 400 to 500 milligrams per milliliter. 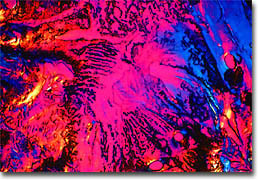 These are concentrations approaching those found in bacterial nucleoids, dinoflagellate chromosomes, virus capsids, and sperm heads, indicating that the DNA in these organelles probably exists in a liquid crystalline state. Only certain regions of a DNA molecule are actual genes that act as hereditary units, while most of the genome is considered "junk DNA" of unknown purpose. The human genome, for instance, contains 3 billion base pairs, but only exhibits about 30 to 40 thousand genes. The sequence of bases contained in each gene codes for the synthesis of a certain protein, the amino acids of the protein being determined by the arrangement of the bases. Interest in mapping and sequencing the genes present in human DNA flourished in the late twentieth century, culminating in the 1990s in the initiation of the Human Genome Project (HGP). A collaborative, international effort, the HGP was completed in April 2003, two years ahead of schedule and under budget. Thus, the world now possesses full knowledge of nature's entire genetic blueprint for constructing a human being. What this information will be utilized for in the future remains to be seen, but it may lead to revolutionary new ways to diagnose, treat, and even prevent the thousands of disorders that affect Homo sapiens. However, many people are concerned about the ethical, legal, and social challenges involved with genetics, and a number of issues will need to be addressed in order for advances to be made responsibly. Nevertheless, attempts to derive meaningful knowledge from the human genome, as well as to devise practical applications for this knowledge, will likely dominate biological research for many decades to come.